The site of Van Bibber’s Leap, legendary Van Bibber’s Rock rises above the Kanawha River below Kanawha Falls. The arrival of spring in what would become West Virginia in the late 1700s was not often met with the enthusiasm with which we might greet it today, for fair weather also increased the potential for attack. While the Iroquois and Cherokee had ceded their claim to the region west of the Alleghenies, the Shawnee had not. Their braves were raiding European settlements whenever the opportunity arose. Hiram Van Bibber learned of the murderous will of Shawnee one April day during an event that has since become of the most widely known in the annals of the frontier in the Mountain State. The legend can still be heard around campfires on the river where anglers now roam, though perhaps it is less well known these days than it had been only a few decades ago. The following version of the tale of Van Bibber’s Leap was written by Henry Harding in The Youth’s Companion published Dec. 6, 1883. 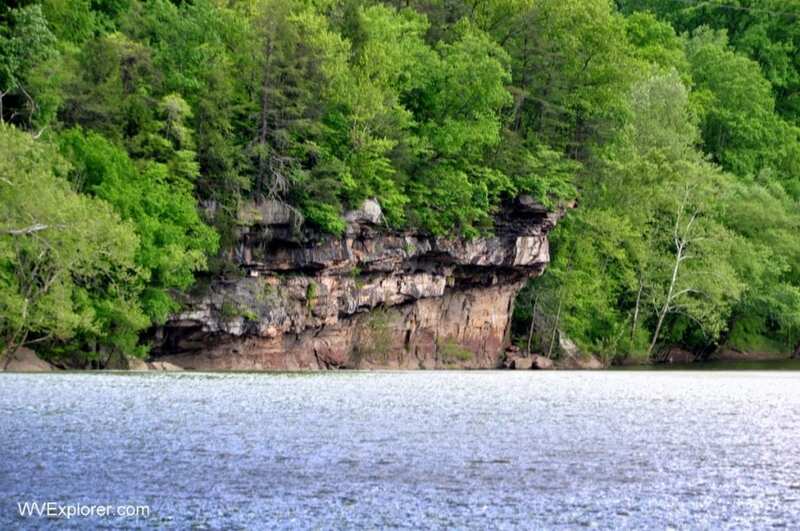 Just below the falls of Kanawha, there is a lofty and overhanging rock of immense size, which to this day goes by the name of Van Bibber’s Rock, and the incident which thus designated it is one of the wildest and most exciting to be found in the records of backwoods adventure. The Kanawha River above Kanawha Falls. Photo by Rick Burgess. The rock juts out about a hundred feet over the seething whirlpool at the foot of the falls, at a height of nearly a hundred feet above the water. The immediate surroundings are wild and picturesque in the extreme, though the opposite shore is comparatively level, being covered with pastures, meadows and timber and having a gently shelving beach of sand sloping gradually out into the boiling waters, which continue their disturbed and riotous character for many rods below. 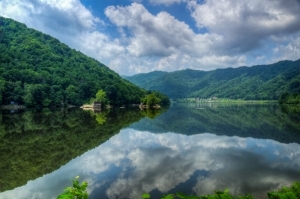 Hiram Van Bibber, an enterprising backwoodsman from the eastern part of Virginia, was the first to build a cabin upon this inviting bank of the Kanawha in the latter part of the last century. Having had much experience, and being a bold and independent character, he lost no time in bringing his young wife and two children to the new home that he had provided for them. Notwithstanding that the region round about swarmed with hostile or semi-hostile Indians, he was unmolested for a year or more, and the land was so fertile that it was not long before a little settlement sprang up, which, with Van Bibber at its head, presented quite a village-like appearance, the settlers building their cabins near together as a mutual protection against the savages. A small government supply station was also established a few miles further down the stream, which added greatly to the general sense of security and repose. Still, the wild and rocky region, which included the opposite bank, continued to be occupied by moving bands of red hunters, who, if not actually hostile, often cast glances of sullen discontent and jealousy upon the fairer portion of their ancient heritage, which the industry and enterprise of the pale-face intruders were swiftly causing to blossom like the rose. Captain Van Bibber was the soul and heart of the little settlement. His renown as a hunter and Indian fighter was only equaled by his reputation for fair-dealing and worldly prudence, and from the first he was looked upon by his neighbors as their natural leader. Another child was born to him in the bosom of the wilderness. His wife was happy and contented, and his cabin was the abode of frugal thrift and hard-earned repose. The only other member of his household, besides his wife and three children, was a great pet bear called Brownie, which he had captured when a cub and so thoroughly tamed that it was accustomed to follow him, un-muzzled, among the cabins like a dog, apparently with no inclination to rejoin its kind among the neighboring hills. Indeed, the brute displayed an exceptional affection for him and his family. The officers and soldiers of the little fort often came to witness its tricks and pranks, and “Van Bibber and his bear” was the expression most generally used by outsiders alluding to our hero. Trouble with the Indians at length arose, which, so far as one tribe — the Shawnee — was concerned, soon broke out into open war. The authorities were constantly on the alert, and it became a hazardous experiment for any settler to proceed alone through the rocky and thickly timbered region on the unfriendly side of the river. A great freshet had so flushed the falls that Van Bibber did not venture to cross the river at the point directly below the rapids and just between the settlement and the great rock. He passed down the stream for a mile or more to a lonely cabin, occupied by a hunter named Radcliff, where he borrowed a canoe, effected a crossing, and fearlessly plunged into the heart of the enemy’s country. He had capital sport and shot a number of deer and wild turkeys, which he secreted to await a conveyance to his home when the subsiding waters should enable him to make another trip on horseback for that purpose. It was toward the middle of the afternoon when he started to return home, from which he then found himself about eight miles distant. Up to this time he had not encountered a single red man or even any signs of their being in his vicinity, but he had no sooner quitted the belt of timber in which he had been hunting and begun to make his way across the broad, rolling, and somewhat broken plateau that lay between him and the precipitous river-bank than a shot from a concealed foe whistled through his squirrel-skin hunting-cap. He at once crouched close to the ground and prepared for fighting, but another and yet another shot followed the first in quick succession, and upon peeping up from his covert, he saw a score or more of savages cautiously but rapidly approaching from different points of the forest. He knew them to be hostile Shawnees from the peculiarity of their scanty costumes and therefore understood that nothing but his scalp would satisfy their murderous intentions. They had him almost surrounded. There was nothing to do but to run for life. So, on bringing down the foremost by a well-directed shot, Van Bibber suddenly sprang to his feet and sped over the open plain, escaping the numerous shots that were sent after him and with the entire band in yelling and blood-thirsty pursuit. Van Bibber was a famous runner, however, and was under no apprehension of being overtaken by his enemies, swift of foot as they undoubtedly were. He had long been noted as the strongest, fleetest and most formidable hunter of the Kanawha Valley, and nobly did he vindicate his reputation on that eventful day! He not only acquitted himself so creditably as to keep beyond the range of the poor rifles with which his pursuers were armed but was also enabled to load and fire as he ran, thus causing several of them to bite the dust before they finally drove him to bay out upon the further-most point of Wah-kun-gee-tah, the great, jutting rock overlooking the terrible whirlpool at the foot of the falls and his humble-but-smiling home on the far opposite bank. Though unable to overtake their fugitive, the Indians had succeeded in baffling all his attempts to reach the river at the point at which he had effected a crossing in the morning. They had so managed to dictate the direction of his flight as to bring him at last to a final and apparently hopeless stand upon the very edge of this tremendous abyss with obviously no choice left him but surrender to death at their hands or face an equally fatal plunge into the boiling, cauldron-like whirlpool far, far below. But even in this desperate strait, Van Bibber did not lose a jot of his cool and collected daring. Sheltering himself behind a small group of stones and bushes and loading and firing his trusty rifle with wonderful rapidity, he succeeded in keeping the enemy at bay for more than a quarter of an hour—now in full view of his wife and friends on the opposite bank of the river. The Indians, though not venturing out upon the open shelf within range of his terrible marksmanship, clustered along the bushy sides and even crept down far below the very face of the cliff, yelling like demons in the certainty of his speedy capture or death. Captain Van Bibber suddenly stopped firing, and for the first time a feeling of despair must have come over him. He had used the last bullet in his pouch and was no longer capable of defense. The savages soon suspected as much and began to swarm over the top of the rock in full view with vengeful cries. But at this instant, when he was about giving himself up for lost, a clear, encouraging cry came floating to him from far across the yawning abyss, making itself distinctly heard above the roaring of the waters. It was a woman’s voice — his wife’s. He turned and looked in the direction from which the summons had come, dazed and bewildered, for such a leap had never been made nor even contemplated before, but the heroic woman was already in the canoe, paddle in hand, having laid her baby on the grassy bank and rushed to the rescue in spite of the opposition of her neighbors, who looked upon her husband as already doomed and regarded her attempt to navigate the boiling waters of the whirlpool as simple madness. But she pushed off, and just as she did so, Brownie, the pet bear, clambered into the stern of the canoe and sat upright upon his haunches, keeping his balance perfectly and really aiding not a little in “trimming boat” and ballasting it, as it were, throughout the wild voyage. As Mrs. Van Bibber succeeded in reaching the center of the stream directly under the ledge of the rock, her husband’s foes were almost upon him. With this, and with the clutches of the Indians almost closing upon him, he sprang from the crag, and descended like a plummet into the water, feet foremost. In an agony of suspense, his wife rested from her toil for a moment, watching for him to rise to the surface, the canoe bobbing about like a cockle-shell upon the angry flood, and the pet bear eyeing his mistress affectionately, as though fully sympathizing with her distress. It was only a moment, but an awful one, — it seemed an age to her. Would her husband ever rise? Her earnest gaze seemed to penetrate the very depths of the turbid water, and, then, with a joyous, thankful cry, she darted the canoe further down the stream. He rose to the surface quite near to her and was enabled to scramble into the little craft without assistance amid a shower of bullets that was poured after him by the baffled Indians, not one of which, however, harmed either him or his wife. Seizing the paddle from her hands, he swung the craft around, turning Brownie’s back to the hostile bank, and paddled swiftly out of range of the shots that were still showered after him. But it’s more than likely that poor Brownie had much to do with the immunity with which his master and mistress were permitted to draw out of range. At any rate, when Van Bibber and his wife reached the shore and were assisted to land by their rejoicing friends, Brownie remained seated motionless in the stern of the canoe with his tongue hanging out and his eyes closed. The bear was found to be stark dead. His back was fairly riddled with bullets, more than one of which must inevitably have reached the human occupants of the boat for the chance bulwark that had been presented by Brownie’s tough and shaggy frame. Captain Van Bibber experienced such a shock from his terrific leap that he was many days before he fully recovered. But he and his wife lived to a green old age with their family around them in the same fertile valley and within the very shadow of the great overhanging shelf which has ever since borne their name in deserved commemoration of Van Bibber’s leap. — Henry Harding in The Youth’s Companion, Dec. 6, 1883.